Dress up to get down. Time to unleash the carnival spirit and don your most outrageous outfit for this legendary event. A full on night of fantastic revelry featuing three live bands: The Brass Funkeys, Chantelle Duncan the Mariachi Las Adelitas and Bad Mutha Funker to keep the energy high to the early hours. The Brass Funkeys are an 8-piece London-based Brass Band who draw on the traditions of New Orleans. Formed in 2011, they have played at major festivals including Glastonbury, Wilderness and the North Sea Jazz Festival as well as London venues including The O2 Brooklyn Bowl, Koko Camden, and Ronnie Scott’s. 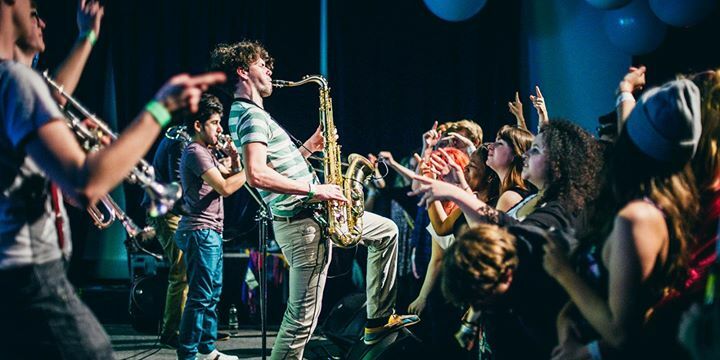 Whether performing a powerful amplified stage show or as a totally mobile marching band, the Brass Funkeys bring together some of the most talented musicians in London in an eclectic live show bursting at the seams with ideas and infectious energy. Session singer and artist in her own right Chantelle Duncan, has teamed up with husband Greg Heath and her favourite musicians to deliver her own brand of jazz, funk, soul and pop to get the party started! Kiwi saxophonist and composer Greg Heath. Greg Heath has been resident in the UK since 1986 and has worked with a wide range of jazz and popular musicians, including Dr John, Jimmy Cliff, Omar Hakim, Rachael Z, Nile Rogers, Mica Paris, Maceo Parker, Van Morrison and Joan Armatrading. Guitarist Phil Capone worked with ex-Led Zeppelin manager Peter Grant in the 80’s on the short lived Wild Honey project, then moved on to become the house session guitarist for Arista Records. Phil also has fourteen self-tuition books currently published worldwide including the critically acclaimed Exploring Jazz Guitar and The Guitar Chord Bible. Hugo Degenhardt is a world class British drummer who has toured and recorded with a wide variety of elite performers, including Robbie Williams, Bryan Ferry, Steve Hackett, Kylie Minogue, Rod Stewart, and Jack Bruce. Hugo was also a member of the influential, Brit Pop band Honeycrack and enjoyed a run as Ringo Starr in The Bootleg Beatles. Originally from Scotland but now based in the South East, Chantelle Duncan performs in a wide variety of musical genres including jazz, funk, soul and pop. She has worked with numerous luminaries including Ronnie Wood, KT Tunstall, Sister Sledge, Dr John, Nile Rodgers, Nerina Pallot, Phillip Bailey, Gilbert O’Sullivan, Brian May, ABC, Alexander O’Neil and Marc Almond. The Mariachi Las Adelitas UK are an exclusive all female and authentic mariachi band. 5 piece band with trumpet, Violin, Guitar, Vihuela and Guitarron, 3 lead singers bringing you tight vocal harmonies and mariachi classics!